A business strategy with a heavy focus on innovation has enabled Lhoist, a family owned Belgian company, to become one of the world’s leading providers of Flue Gas Treatment (FGT) products and solutions. In the following article, Johan Heiszwolf, Lhoist’s R & D Director for environmental applications and Antti Heikkilä from gas analyser manufacturer Gasmet Technologies (Finland) explain how Lhoist’s continual investment in innovation has led to impressive growth in a variety of market sectors, including FGT. 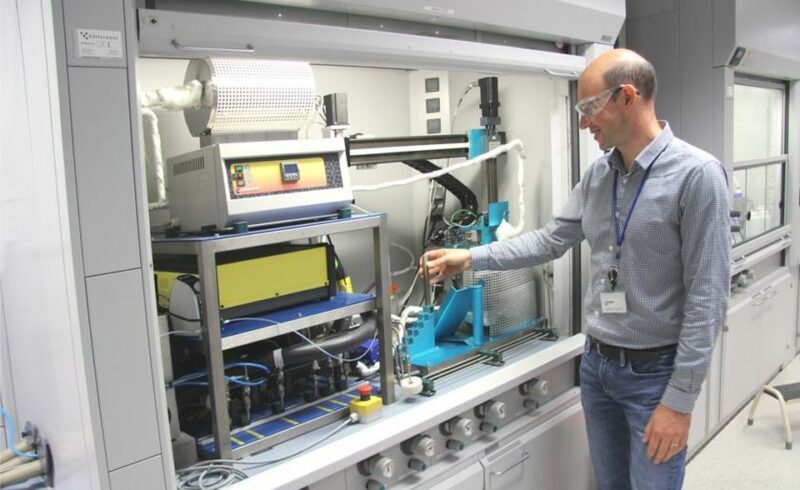 Working closely with Gasmet’s Belgian Distributor, Kelma NV, Lhoist has developed laboratory, pilot scale and mobile process monitoring capabilities to evaluate FGT products that are still in the development phase or to demonstrate the effectiveness of existing FGT products at customers’ sites. Lhoist’s roots go back to 1889 when Hippolyte Dumont opened a factory in Belgium. Since that time, the firm has spread internationally: first to France in 1926 on the impetus of the founder’s son-in-law, Léon Lhoist, who further developed the company by acquiring lime, limestone and dolomite plants in Belgium and France. Today, Lhoist is a world leading producer of lime, dolime and minerals, with facilities across Europe, the Americas and Asia. Over the past 35 years, Lhoist’s production has grown significantly and Lhoist now operates more than 100 facilities in 25 countries, with around 6,000 employees of around 40 nationalities. Lime, clay and the derivatives of these materials are used in an extremely broad spectrum of industries including agriculture, construction, oil and gas, chemicals, glass, metals and environmental protection including water, wastewater and FGT. The FGT market has grown considerably in recent decades as a result of higher environmental standards and the development of regulations that imposed emissions limits on industrial processes. These regulations have also driven growth in Gasmet’s business as process operators around the world have sought to monitor multiple gases simultaneously with FTIR analysers in order to demonstrate compliance with emission limits. One of the reasons for the diversity of Lhoist’s markets is the company’s focus on innovation. Just outside Brussels, the company has established a ‘Business Innovation Centre’ (BIC) which is known as a ‘360 degree talent incubator’ because many of the group’s new recruits spend time at the BIC in order to learn about the group’s culture and its core competencies. Focusing on Research & Development, Intellectual Property, and Strategic Marketing, the BIC staff come from 15 different nations and are given time to spend ‘scouting’ for new scientific solutions to commercial challenges. This strong focus on inorganic and application research is one of the ways in which Lhoist retains its position as a leader in key markets and ensures that innovation continues to drive the growth of the company. One of the first product groups to be developed by the Lhoist BIC was Sorbacal®which is employed for the removal of major acid pollutants (SOx, HCl and HF) in gaseous emissions from combustion plants such as power stations and incinerators. A number of different products within the Sorbacal® range were developed to meet the needs of different processes. For example, particles of Sorbacal® SP/SPS have a much larger surface area and pore volume in comparison with standard hydrated lime, so this product is employed in applications that require enhanced performance. An enormous number of tests have to be undertaken to evaluate potential new products and in the case of FGT, the effectiveness of candidate products to remove pollutant gases is key. The BIC laboratory therefore developed a capability to generate artificial flue gas mixtures containing acid gases (SO2 and HCl) in a mixture of N2, O2, CO2, H2O and NOx. The gas composition of this artificial flue gas was tightly managed with mass flow controllers in order to ensure an accurate comparison of pre- and post-treated gas for each product under evaluation. The laboratory trials effectively assess the intrinsic capacity of the sorbents and if they perform well, the assessment process is continued in a pilot plant to evaluate performance under simulated operating conditions. The pilot plant was also developed by the Lhoist BIC, and is capable of generating a mixture of gases and steam at 180 Deg C to mimic aggressive emissions. The pilot plant is also able to measure sorbent performance under dynamic conditions with varying gas concentrations and temperature. The pilot plant consists of two separate units – each capable of generating dynamic emissions across a broad range of conditions. 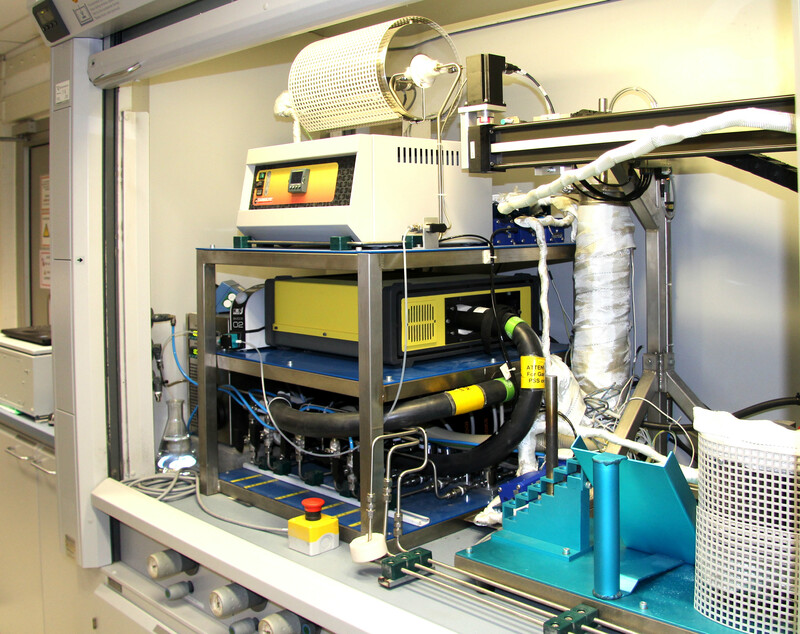 The emissions from the older of the two units are monitored with a Gasmet DX4000 heated multigas FTIR analyser. 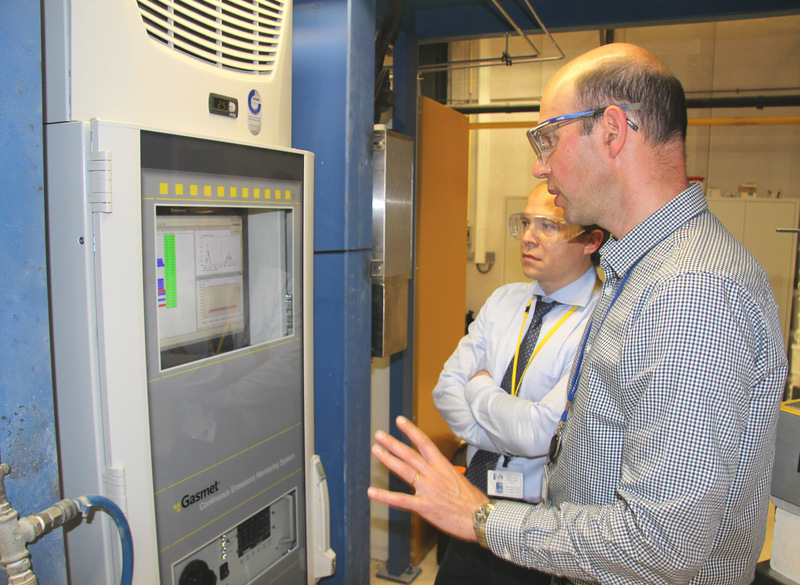 A new pilot unit is monitored by Gasmet’s fixed Continuous Emissions Monitoring System (CEMS) which analyzes gas both before and after treatment using a heated switch-over system. In addition to the chemical characteristics of the sorbent, Lhoist also places a heavy emphasis on its physical characteristics. For example, the grains of a dry powder product have to be fine enough to be reactive, but not too small to negatively impact the flow behavior of the powder. In addition to the laboratory and pilot plant facilities, Lhoist has also developed a mobile system that is able to operate at customer sites. Historically, this necessitated the deployment of a large truck, but thanks to the compact nature of the portable FTIR analysers, this is no longer necessary; KELMA has supplied two Gasmet DX4000 portable FTIR analysers in customised rugged transport cases so that the monitoring equipment can be quickly and simply shipped around the world to customer sites. The FTIR analysers can even be operated completely remotely at a customer site. 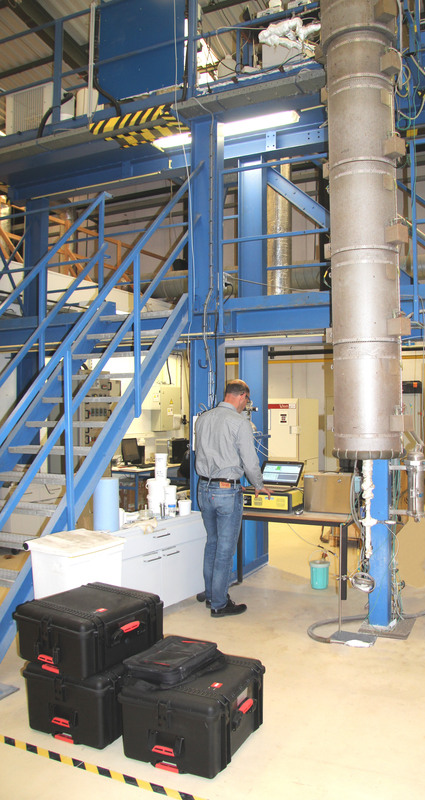 For example in a recent trial two FTIR analyzers, measuring inlet and outlet gas composition, were installed in a plant in the USA while they were monitored remotely from Belgium. The experts from KELMA could log-in to the FTIR analyzers and could perform a software update and calibration. The benefits of onsite demonstrations are considerably advanced by the capabilities of FTIR gas analysis. FTIR (Fourier Transform InfraRed) is a sophisticated technology for analysing sample gases both qualitatively and quantitatively. The key feature of these instruments is their ability to monitor multiple compounds simultaneously. The Gasmet FTIR analysers are capable of measuring almost any gas and have been developed over many years specifically for the emissions monitoring market. This means that they are extremely rugged and work reliably in both fixed and portable versions. However, a key benefit for environmental applications is their ability to analyse hot, wet, aggressive gas mixtures. All of the company’s FTIR instruments, fixed and portable, contain exactly the same core analyser which means that they can be operated with the same software, no extra training is necessary and results are directly comparable. Using Calcmet™ software users of Gasmet analysers are able to analyse sample spectra, producing almost real-time data for pre-selected compounds. However, the retention of recorded spectra offers an opportunity to identify ‘unknowns’ by comparison with reference spectra, and to analyse recorded spectra retrospectively for compounds that were not necessarily of interest at the time of the measurement. For example, Lhoist now includes SO3 in many of its measurements and now has the ability to study measurements for this compound from readings that were taken in the past. This highlights an important advantage of FTIR – when it becomes necessary to measure new compounds, because of new legislation for example, no extra hardware is necessary, so the additional costs are negligible. In contrast with many traditional gas analysers, the Gasmet FTIR instruments do not require periodic recalibration. A daily background spectrum measurement with zero gas (nitrogen) is enough to preserve measurement accuracy. Instead of periodic span calibrations, reference spectra for analysed gases are measured at the factory when the instrument is made and these do not drift. From Lhoist’s perspective, Alain Brasseur says: “The ability to work with wet, corrosive gases is obviously a major advantage, and since we routinely analyse over 10 gases, monitoring is much less complicated now that we can do so with just one analyser. “The size of the Gasmet analysers is also a major advantage for us – they fit neatly into the automated testing system which is installed in a normal lab fume cupboard, and the portable equipment is easy to transport to remote customer sites. In summary, the evolution of Lhoist’s FGT products has been made possible by giving a talented pool of international experts the freedom to innovate and by working in partnership with like-minded technology leaders such as Gasmet.